Arsenal vice-chairman David Dein has been voted off the Football Association board by the Premier League. 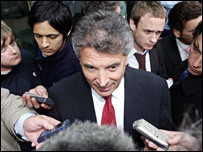 Dein was voted out of office as one of the Premier League's four representatives in favour of Manchester United chief executive David Gill. Gill, 48, is as influential at Old Trafford as Dein is at Arsenal.